Sodexo, world leader in Quality of Life services, is making major reductions in both waste and carbon emissions at the facilities, cafés, sport and leisure venues and other food service sites where it operates. The integrated facilities management and food service operations organization manages more the 32,000 client sites worldwide, which means its commitments can have a major impact. By 2025, Sodexo estimates it will have reduced carbon emissions at food service and facilities management sites by 34 percent through simple changes, such as using energy efficient HVAC systems at worksites or repurposing used cooking oil as biodiesel. These and other results are detailed in an infographic released today by Sodexo. 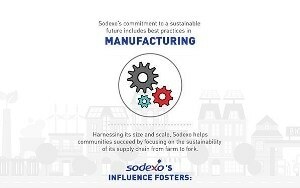 Titled "Serving Customers," the infographic illustrates how Sodexo fosters healthy environments and communities by looking at sustainability as the red thread that weaves throughout the fabric of all its business. "Because Sodexo serves 9,000 sites in North America alone, the impact of its sustainability commitments is more than considerable," says Ted Monk, vice president sustainability and corporate responsibility. "Using just one example, more than 7,300 Sodexo locations in North America recover used cooking oil to turn it into biodiesel fuel. That alone saves 1.3 million pounds of carbon dioxide emissions, which is the equivalent of not driving a car 1.1 million miles." Throughout North America, Sodexo sites have embraced the culture of sustainability, with more than 7,200 sites recycling aluminum and paper and 8,640 recycle cardboard. The company's efforts to encourage sustainability have added benefits to health. One hundred percent of its cafés offer plant-based choices and 49% of menu options are vegetarian or vegan. Not only nutritionally sound, these meal choices can reduce a person's carbon footprint by nearly half that of a meat-based diet.